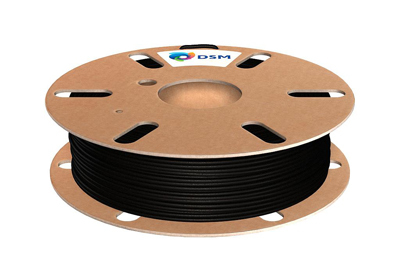 18 Sep 2018 - Royal DSM announced its new carbon fiber-filled PA6/66 filament Novamid® ID1030 CF10 for 3D printing. Despite the low carbon fiber loading of 10% - much lower than other carbon filled materials - it produces functional prototyping and industrial parts with properties close to what is usually achievable only by injection molding while matching the easy and fast printing of unreinforced plastics, DSM says. Filled with only 10% of actual carbon fiber - much lower than most carbon filled materials - Novamid ID1030 CF10 3D is designed for printing structural parts which are stronger, stiffer and tougher with higher tensile strength and modulus, high dimensional stability and free of warpage, the manufacturer claims. DMS says that these mechanical properties and smooth appearance make the product ideal for a very broad range of applications that require robust performance possibly at elevated temperatures such as automotive under-the-hood, protective and supporting sports gear; manufacturing jigs and fixtures; medical braces and prosthetics. It’s also a go-to-material for light weight applications across various vertical markets. The material can be printed on standard desktop fused filament fabrication (FFF) machines with a hardened nozzle. According to DSM, tests have shown that users can run their printers at the same speeds as with unreinforced plastics, while achieving considerably better strength and toughness.